Like most Japanese architecture, Shelf-Pod was designed with traditional techniques, based on the Japanese woodcraft of Kumiko, in mind. The interlocking shelves are at varying levels, which form practical areas like stairs, table tops and other surfaces – these function as storage shelving as well. With the geometrical harmony of Islamic architecture in mind, the dimensions of the shelves are also proportional to the stairs, windows, desks and chairs within the structure. Kazuya Morita reinforced the structure to earthquake-proof the house by adding additional support to each shelf. 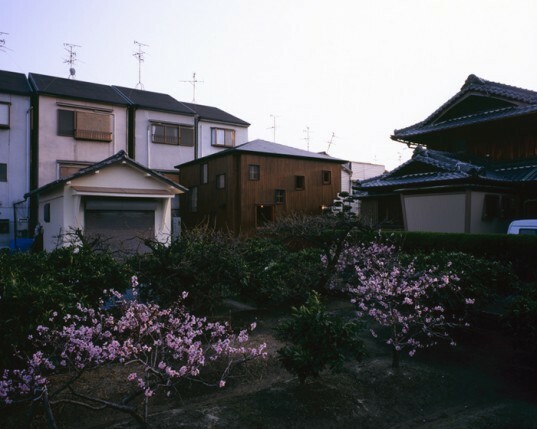 The exterior uses the same design as traditional Dozou, or storehouses, with bamboo netting covered with a clay and straw mixture. With so much shelving everywhere, one can only wonder just HOW many books the owner could possibly have. 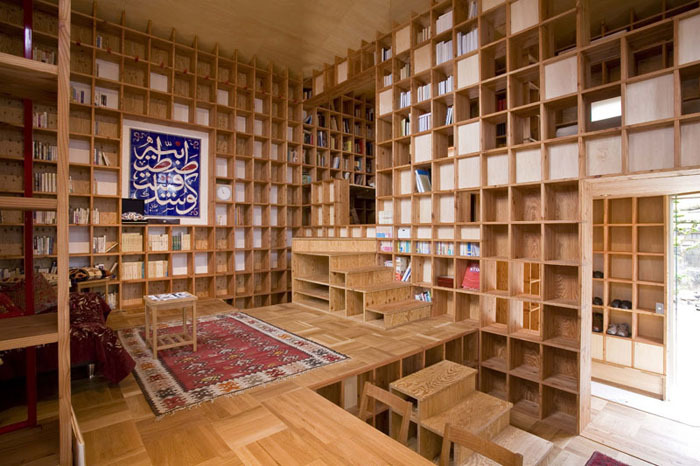 I like this solution and I love the bookcase. Maybe is possible that I re-use this solution for a little house that now I'm making. Obiouvlsy, an ispiration not equal. I don't know what faith the owner belongs to but Muslims don't display Arabic calligraphy in the bathrooms. Nice interiors though. My dream house! I dream of owning a house where every wall is book shelves. I am addicted to book shelves. In addition to never needing to be re-painted, you have so much storage space you might have to buy more stuff to put into the empty spaces.